Going into this chicken-farming thing (or egg-farming thing, depending on your point of view), one of my biggest concerns was that we were somehow or another going to hurt or damage or even, gulp, fatally injure one of our chickens out of best intentions but poor execution. Prior to owning Sophia and ZsuZsu, I'd never had much experience being around birds that still had feathers on them. Sure, I'd seen plenty of birds in my life, but the only time I'd ever touched a live bird was only very recently: two years ago at a local festival there was a guy with a parrot who let me "hold" the bird in my hand for a moment. I couldn't get over how such a big colorful bird could be such a light-weight! Of course, my analytical, logical side was unimpressed, but my emotional side was floored at the whole thing. I came away from that brief encounter with a profoundly different view on the whole bird world. So, as LeftCoastMom and I talked about getting chickens of our own last Winter, my biggest fears revolved around inadvertently doing something that would kill them. Just take a look around at our house plants, or lack thereof, and you'll understand where this fear was coming from. 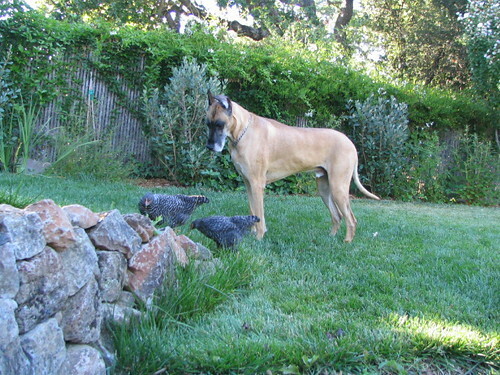 Sure, we've owned a Great Dane (named Argus) for eight years now and he seems to be doing fine. Sure, he's a real princess that needs a soft bed to sleep on and won't go outside willingly if there's anything but bright blue skies and needs his food prepared just so. But these chickens are small birds that needed to be cooped and protected from predators and provided fresh water at all times, etc, etc. And what if it got too cold or rained too much or got too windy? They'd be stuck outside! Turns out I've been projecting the relative frailty of our large breed dog onto the girls needlessly. The chickens are actually a lot more resilient than he is! This winter, as the temperatures have hovered around freezing, the girls are showing no signs of distress whatsoever. They're always out and scratching around at dawn, no matter how much frost is on the ground around them. There have been times this winter when it's rained all day, and the Argus has cowered on his comfy bed indoors refusing to go out to relieve himself no matter how big his bladder has to stretch to keep him indoors. Where are the girls? Scratching around in the rain, seemingly enjoying themselves tremendously as the drops come down and make the dirt all the easier to move around. Nothing seems to faze them, and through it all, they're quite the little egg-laying machines, too. What more could I ask for? Well, maybe they could teach the dog how to weather the elements a bit better. Heh, heh, heh! Yes, I also was worried about how my chickens would weather the winter here in cold Chicago. Certainly they are wearing little down jackets, but their poor feet look so vulnerable. Not so. Just in the past week it's down as low as -4F -- and that's without the windchill factored in. The ladies have done just fine. The coop has a bit of supplemental heat from a clever little heat mat, but it still has gotten as low as 15F inside the coop at night. No problem for the hens. Actually, I'm more worried about keeping their water from freezing. In these extreme temps, the bird-bath immersion heater I bought to put in their Glug water container has been unable to keep up. By the end of the day, their water has a crust of ice on top, sometimes fairly thick! They certainly are hardy hens...and yes, I am still getting eggs every day. My six year old and I are in the planning stages for our chickens. Can you tell me a bit more about the heat mat or point me in the right direction? Is it one used in a green house or for starting seeds early? Hey Christopher, glad to see you and the kid are planning for your chickens. 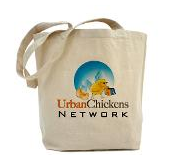 While Linda often visits us here at Urban Chickens, you might have better luck asking her directly over on her Windy City Gal blog. We're too warm here in California to have to worry about such things!